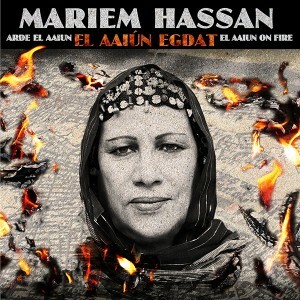 Mariem Hassan, “the voice of the Sahara,” is the best-known cultural representative of the Sahrawi (Western Saharan) people. Her lyrics (primarily in Hassaniya Arabic) tell the story of the Sahrawi’s struggle to govern their homeland (formerly a Spanish colony, it has been occupied by Morocco since 1975) and preserve their cultural identity. Her music is based on Sahrawi traditional lute-playing and drumming -- its bluesy modes, driving rhythms and ululating voice clearly identify it as another branch of the now-famous “desert blues” of the Sahara-Sahel region. Over the years she has gradually added more Western elements to her music, and this new record has the broadest palette of any of her recordings. Reed player Gabriel Flores adds a brand-new flavor (track 4 is a beautiful ballad that could easily be played in a jazz format); guitarist Luis Gimenez is brilliant throughout, equally fluent in North African blues (5 and 6) and West African-influenced fingerpicking (2 and 3). The key instrument, though, is Hassan’s -- powerful, melismatic and filled with emotion, her voice is simply unforgettable. This is a career-defining album from one of Africa’s crucial artists -- don’t miss it.